First things first: this product is out of production, VMHT is out of business, and I am unaware of anyone trying to resurrect this adapter. This makes me very sad, because it’s a pretty clever way of using unmodified Uzi mags, and the machining doesn’t look that hard to do with a CNC machine (especially if you already were making Colt-style mag adapters). On the positive side, a good number of them were made, and they appear on the usual sales boards every few months. Don’t expect them to be cheap – they retailed for $200 on MidwayUSA right before VMHT went out of business. But, if you want to move down this route, it’s still possible. As you can see in the picture, the VMHT adapter loads in from the bottom of the rifle, and is released with the AR-15’s magazine release button. I like this design for its simplicity, but I strongly encourage using a “convertible”-style bullet button if you’re going to use one of these adapters, so that you don’t inadvertently release the adapter onto the range’s concrete floor. To release the Uzi mag, you use the button assembly on the bottom of the adapter, which is sort of jutting out of the bottom of the magwell. 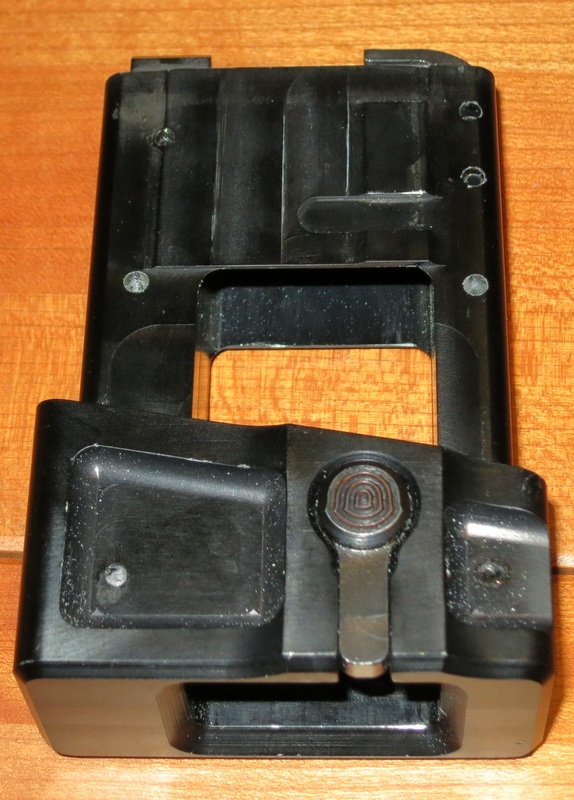 I am not super-impressed with the design of the mag catch, which doesn’t hold the mags as well as it could – you can yank them out of the adapter if you pull hard enough. They do stay put just fine otherwise, so it’s not a fatal flaw. Besides just having to release the mag in a different way, there’s another change to the standard AR-15 manual of arms: no last round bolt hold open. Personally, I don’t care much, and do appreciate that it removes the “broken bolt hold open” problem that plagues the Colt-style mag system. But I do recognize that some people see this as a serious problem. The adapter itself also has fitment issues. It would simply not lock in on a Head Down Products billet lower, albeit it was OK with a CMMG forged lower. It also does not accept Uzi mags without a “back rib”, at least not without further filing of the adapter. There were many of these magazines in the country when these adapters were being made, so I’m not sure why that is… seems like it would be simple enough to duplicate the dimensions of the Uzi magwell, and the feeding is not super-dependent on an ultra-tight fit for the mags. However, once you’ve found the combination of lower and magazines that the adapter works with, there is one more caveat: it’s basically impossible to lock in magazines loaded to 32rds. Downloading them to 31rds fixes this problem. Once you’ve gotten that final problem solved, the adapter is quite excellent: no feeding or ejection problems. It functioned as expected with both steel-cased and brass-cased ammunition. Reloads were pretty fast, even with the Uzi-style changes – you have to master the art of pulling the mag out while pressing the release button with another mag in your hand. Thankfully, Uzi mags are on the small side, so that’s not as hard as it sounds. The adapter also has a bit of a funnel to it, so you can miss slightly and still get it in. You can probably see why these adapters weren’t more popular. 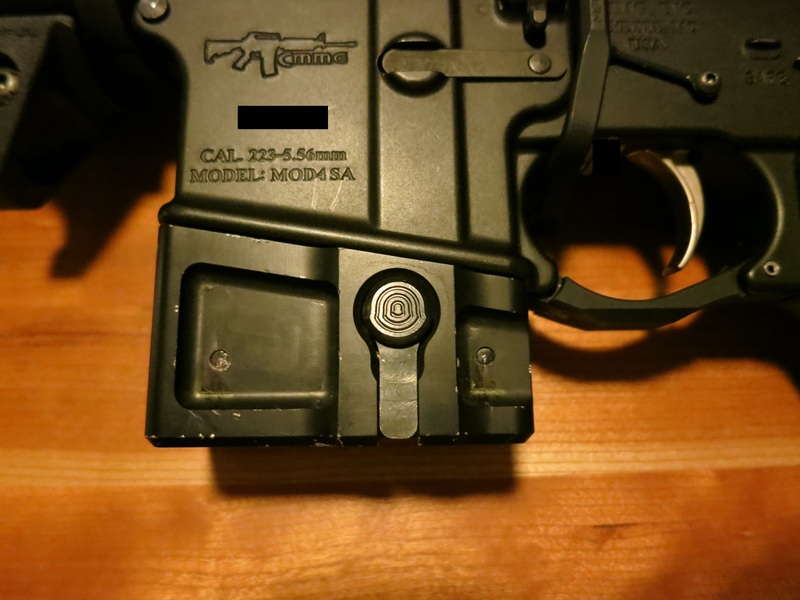 They were expensive, they were finicky, they required a bullet button for safe usage, and they changed the AR-15’s manual of arms in a couple significant ways. That’s really quite a hard sell compared to the plug-and-play top-loading Hahn Colt-style adapters, or even the DDLES/QC10 Glock/Colt lowers. On the other hand, if you’re heavily invested in Uzi mags and don’t have any Colt-style mags, AND plan on using a dedicated 9mm AR-15, AND can live with the change in the manual of arms, AND are willing to deal with the finickiness of the adapter, it’s really not a bad option. Once you’ve figured out the magic to making it work, it stays working. I’ve been looking for a used VM Hy Tech adapter for almost five years now, and they have become almost unaffordable and impossible to find. I got tired of waiting, and assembled my own Uzi mag adapter, using an actual, surplus, steel Uzi mag well. A standard mil-spec AR15 lower receiver doesn’t have quite enough width in the magazine well, to accept an adapter based on real Uzi parts: fortunately, the excellent GWACS Armory CAV-15 lower has more than enough room (the CAV-15 was designed to accommodate .45 ACP ‘grease gun’ magazines for 45 caliber AR conversions). The CAV-15 lowers have been in production for years now, and are probably still the best polymer lowers available (possibly more durable than mil-spec aluminum lowers, but that’s another story ;>). with hand tools, and not a big investment (in case Murphy’s Law kicked in ;>). Final cost for me was approximately $60, including the Uzi mag well, the polymer adapter, and a ‘bullet button’ AR mag release. The result is a 3-piece adapter (with a small filler panel for the excess space on each side) that is easily removable, but rock solid when locked in place. I have several hundred rounds of Federal 9mm through it so far, with only a couple of misfeeds (which I think were mag related).